Along with helping her clients, artist and licensed board-certified creative arts therapist, Sara Roizen, also creates her own amazing art. One style in particular that really caught my eye: painting mandalas on vinyl records. What a fantastic way to repurpose albums. Out of all the ones posted on her site, this one captivated me the most. I love the serenity and dreaminess of the blue/green background with the vibrant energy of the white patterns and circles in the foreground. Just magnificent. My approach as an artist has always centered around the process rather than the finished product. I work spontaneously and intuitively in the studio in a form of dialogue between myself and the materials. This process is a constant self-exploration, often revealing feelings of which I was previously unaware. You can follow along with her art creations, art journal, and art therapy via her ArtTherapySpot blog site. I’ve had the thought many times to create mandalas on albums and have yet to follow through on it. 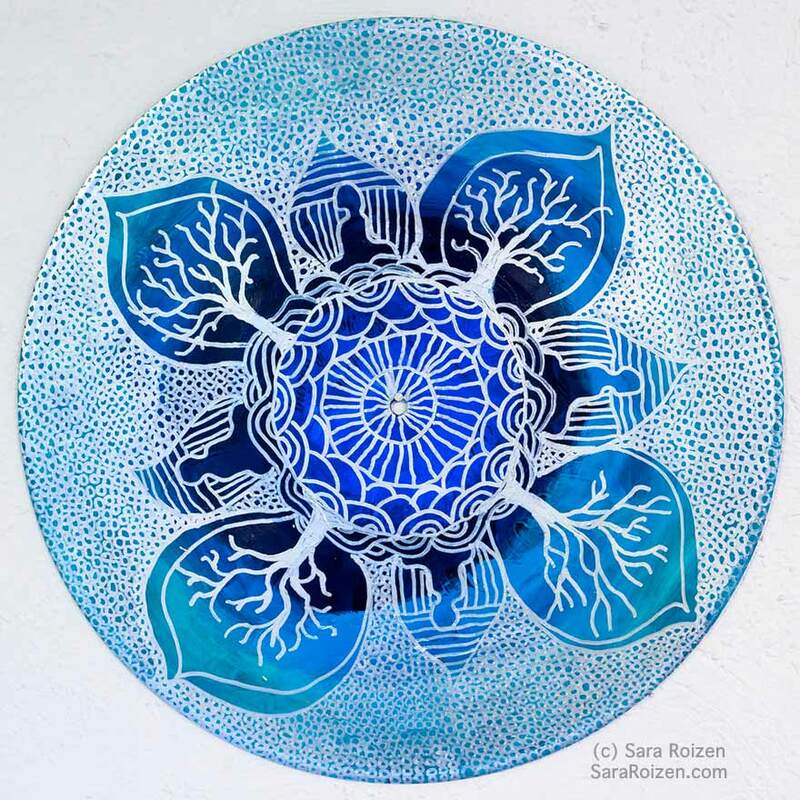 Seeing Sara’s beautiful vinyl record mandalas, I may have to reconsider…giving them my own creative “spin” of course. Thank you so much for featuring this mandala on your amazing site! I often visit here for mandala inspiration and I was so touched to see that you had shared one of my mandalas. What an honor to have this mandala featured on your site. I come here often for mandala inspiration and I was touched to see one of my vinyl record mandalas chosen for mandala of the day! Thank you for the beautiful work you do here. You’re very welcome. It’s my pleasure.